The Lagos State Government on Saturday started releasing the remains of the victims of the Otedola Bridge tanker explosion to their families. The State Commissioner for Health, Dr. Jide Idris, at a news conference in Alausa, on Friday, explained that the decision to release the bodies followed the conclusion of DNA forensic examination conducted by the government to ascertain their identities. 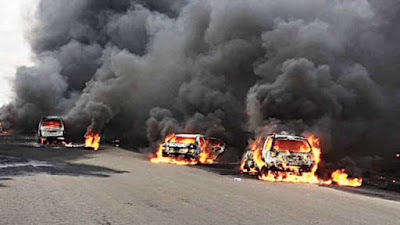 The remains of the victims of the tanker explosion, which occurred on June 28, were taken to the Lagos University Teaching Hospital (LASUTH) where they were examined. Dr Idris said, “Based on the DNA analysis performed at the LSD and FC, all victims samples were successfully matched to relatives’ samples. “Nine bodies have been successfully matched to nine families out of the 11 families that showed up at the LSD&FC. They are now ready to be handed over to the rightful families for necessary burial arrangement. “Collection of these remains will commence from 10:00 am tomorrow (Saturday), July 28, 2018, at the Seminar Room of the Pathology and Forensic Medicine Department of the Lagos State University Teaching Hospital, Ikeja,” he said. Twelve people were killed and at least 50 vehicles were burnt in the tragedy which occurred on June 28, 2018. The explosion occurred when the fuel-laden tanker had a brake failure as it was heading out of Lagos towards the Lagos-Ibadan Expressway. Many escaped by abandoning their vehicles and firefighters later came to the scene to battle and put out the raging blaze.